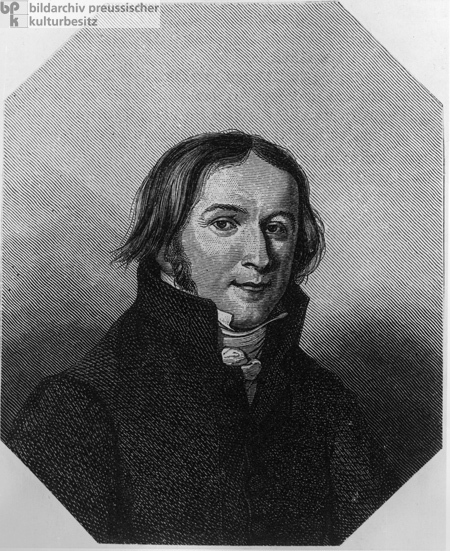 The poet, writer, and nationalist publicist Ernst Moritz Arndt (1769-1860) studied history and theology and taught at the university in Greifswald from 1801 to 1806. A bitter opponent of Napoleon, he was forced to flee the French in 1806 and took refuge in Sweden. Arndt went on to become one of the leading figures in the German national movement, a position he owed above all to his patriotic pamphlets and songs. In 1820, Arndt was suspended from a professorial post in Bonn after making critical remarks about the behavior of the German prices during the period of restoration; he was only reinstated in 1840. In 1848/49, Arndt was a member of Frankfurt National Assembly. He called for the development of German territories into a unified nation-state according to cultural, not dynastic principles. Engraving, 1817.